What is Kirtan and why should you make it part of your yoga practice? We are so fortunate at Forever Yoga to have International Kirtan artist Girish coming to visit us again at the studio in September! 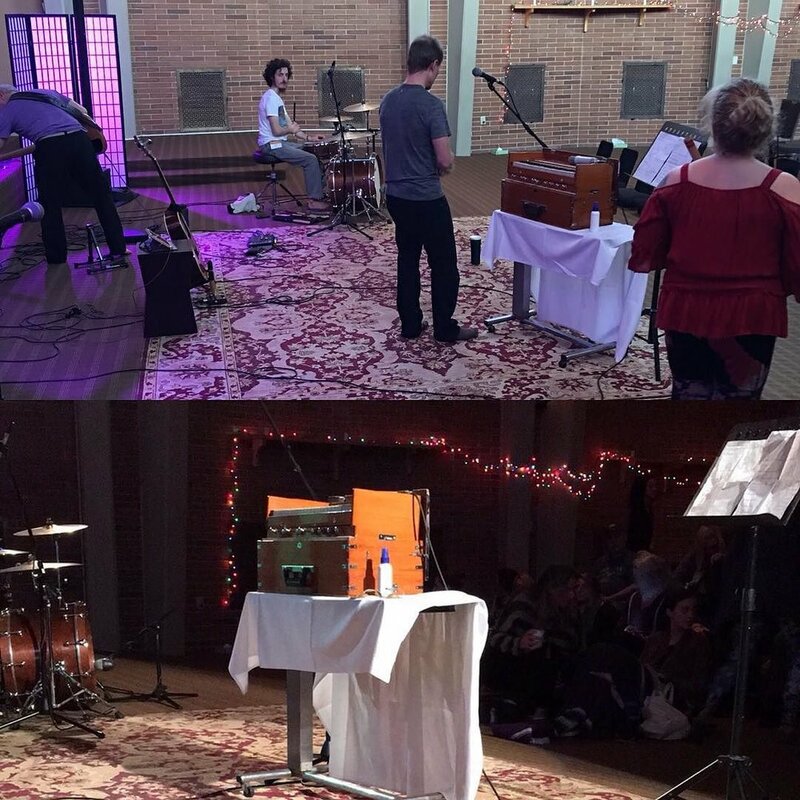 If you haven’t experienced a kirtan before or you’re wondering what it’s all about and why it’s such an amazing addition to your yoga practice, keep reading! Kirtan is a form of live music that often involves Sanskrit mantras. Each artist puts their own sound and creativity into the music, so it can be quite different from person to person or group to group. They may use different instruments from what you might see in a typical rock band to more traditional instruments like harmonium and drums or sitars. Beyond the music, a key element of Kirtan is that it is usually in Call and Response format. In other words, the leader of the group will sing a line, and then the audience will sing it back them. We all get to participate when we go to a Kirtan! What are the benefits of Kirtan? Vibration. Sanskrit is the science of vibration. When we chant Sanskrit sounds, we receive physical and energetic benefits. Kirtan makes that all the sweeter by, as Krishna Das often says, giving us something that makes taking the “Medicine” (the Sanskrit mantra itself) easier to “swallow”. Music just makes everything sweeter. Putting words to music has also been shown to make retention and recall better. That’s why you can still remember every word of your favorite song from when you were a teenager. Want to really learn a mantra? Do it through Kirtan! Stress Relief. Singing has been scientifically shown to relieve tension and relax the body. But what if you feel like you don’t have a great singing voice? No one cares what you sound like! It’s just like when we’re in a yoga class, the only people that care about your down dog is you and your teacher! Everyone is having their own experience and if they’re really paying attention, they aren’t at all concerned with what you sound like. We’re all in this together. And if you really don’t feel comfortable singing, just being in the room with the sound and the others participating can bring you huge benefits. Group Energy. Speaking of the others in the room, group energy is so important in so many of our practices. If you’ve ever done a yoga video at home, you know that it’s just not the same as it is when you do yoga in a class setting. When everyone is moving and breathing together, there’s something special that happens. The same thing is true in Kirtan. It’s just like when you go to see your favorite musical group live. Sharing that experience with others provides a kind of magic that you just can’t get when singing alone in the shower! A sweet form of meditation. You know how you feel when your favorite song comes on the radio (or the Alexa or whatever it is you play music through these days)? Kirtan can give you that feeling in an even more beneficial way. The music we play in classes is often recorded versions of Kirtan. Just like so many other yogic practices, kirtan allows you to release stress, tension and anxiety in a way that is far more beneficial than sitting in front of the TV on a Friday night. Instead of simply distracting you, it actually draws you in to more conscious relaxation. How does it do that? Kirtan is a form of meditation practice! Really! As you chant along with a room full of friends your mind will wander, but it will wander a little less due to the group energy. When you notice you’ve wandered, you just come back to the chant. It’s that simple! You may find that this is the most fun meditation you’ve ever done! I hope you’ll join us for our Kirtan with Girish this month or another Kirtan in the future. You won’t be sorry, I promise! One of the most powerful and SIMPLE tools of yoga that can help YOU right now! Healing Mantras is available in our studio boutique. Mantra is one of the most powerful and most simple to use tools I've learned from my study of yoga. Spend a little time each day repeating a mantra and your life will transform. There's no doubt about it. This month in Jessica's classes we have been working with this mantra: "Om Shri Rama, Jaya Rama, Jaya Jaya Rama"
According to Namadeva Acharya, this mantra is said to be a liberation mantra. Enough repetitions of this mantra will free us from the cycle of death and rebirth. Enjoy 27 repetitions with Jessica through this Soundcloud recording.